Energy models are commonly used to examine the multitude of pathways to improve building performance. As presently practiced, a deterministic approach is used to evaluate incremental design improvements to achieve performance targets. However, significant insight can be gained by examining the implications of modeling assumptions using a probabilistic approach. Analyzing the effect of small perturbations on the inputs of energy and economic models can improve decision making and modeler confidence in building simulation results. This paper describes a reproducible methodology which AIDS modelers in identifying energy and economic uncertainties caused by variabilities in solar exposure. Using an optimization framework, uncertainty is quantified across the entire simulation solution space. This approach improves modeling outcomes by factoring in the effect of variability in assumptions and improves confidence in simulation results. The methodology is demonstrated using a net zero energy commercial office building case study. Bucking, S. (2017). 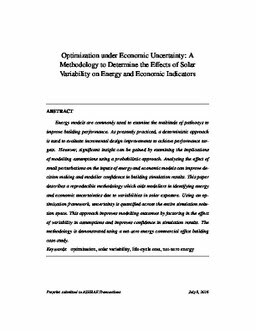 Optimization under economic uncertainty: A methodology to determine the effects of solar variability on energy and economics. In ASHRAE Transactions (pp. 244–253).